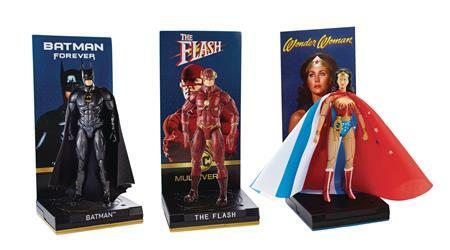 All-time favorite DC Super Heroes are now available as deluxe action figures! The Dark Knight from Batman Forever, and Wonder Woman and The Flash from their classic hit TV series come in 6 1/2' scale, with 26 points of articulation, interchangeable extra hands to create exciting battle poses, portrait head sculpts, and signature costume details. Batman and Wonder Woman also come with cloth capes ready for lightning flight. Each collectors' quality action figure also includes a display base with a removable flight stand and a signature diorama background card for dramatic posing.